Really good movies to watch for. One exam, one generation, three young women. Before them, The Exam, the entrance into adulthood, and Polish exam of life. Don't trust anyone. Don't trust yourself. Amazing movie - a must see! 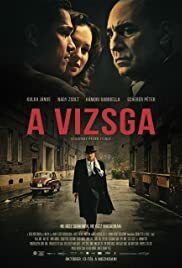 I'm always skeptical about Hungarian movies, because one in every five years meets the standards of other European films, but "A vizsga" left me amazed. The script is written by Norbert Köbli, who's known for translating Syd Field's work to Hungarian, and apparently he took Field's advices. Köbli is outstanding at creating conflicts, exposing character backstories and he's written a couple of great twists. The directing is also great, building up tension nicely, but Köbli's script is making this movie a masterpiece. Gergely Parádi's score is also worth mentioning, only the actors seem a bit unprofessional in this movie. Foreign viewers, who are unfamiliar with the communist regimes in Central Europe, may struggle with understanding the historical background, but the film is a great portrayal of these times. I've only given a rating of 10 maybe 10-15 times in my life to a movie, but this one is a 10. It's as good as the Oscar-winning "Das Leben der Anderen" (The Lives of Others), which revolves around a quite similar topic.